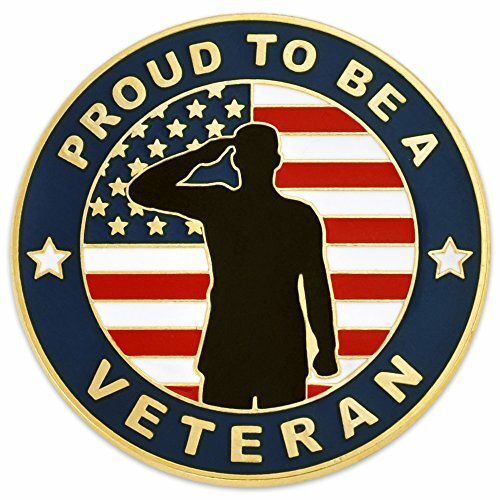 Our Made in the USA Proud to Be a Veteran Pin is is die struck bronze, gold plated, filled with hard enamel colors and hand polished. It features a saluting Veteran in front of the American Flag. It is a classic design, appropriate for everyday or special events. Wear on your lapel, lanyard and hat to display your pride and sacrifice to our country. Each includes a standard clutch back and is individually poly bagged. Our Made in the USA Proud to Be a Veteran Pin is is die struck bronze, gold plated, filled with hard enamel colors and hand polished. It features a saluting Veteran in front of the American Flag.